A little over a year ago, the City of Edmonton held an open house for a new initiative known as Leveraging Technical Expertise Locally (LTEL). The initiative was created as a way to allow the City to gain access to innovative local technology companies who may not otherwise have the scale or resources to participate in a traditional RFP process. The pilot project was a replacement for Edmonton Transit System’s electronic lost and found system. A total of fourteen local companies proposed solutions and the field was narrowed to six finalists in January: Hybrid Forge, Aldata, Aurora Bar Code, Damaag, Stage 2, and XEA Services. Hybrid Forge was selected in February, and they started work on their lost and found solution in early spring. Called Foundtastic, the application goes live today and tomorrow at the City of Edmonton. I caught up with Geoff Kliza and Chad Smith from Hybrid Forge, as well as Loren Andruko and Bruce Beecher from the City of Edmonton, to talk about the process and the new solution. You lose something on the bus in the morning. Later that day, at the end of his/her shift, the driver collects all the items found on the bus and hands them off to the dispatcher at the garage (there are six garages, plus DATS, and the ETS security officers who also find items). The dispatcher does the paperwork for the lost items and prepares them for transport to Churchill Square. The items are transported to Churchill Square, and the items are entered into an Access database. By the middle of the next day, your item has been catalogued at Churchill Square and is ready for staff to respond to your requests. Certain items are special, of course. For passports, driver’s licenses, cell phones, or other easily identifiable items, ETS will proactively try to contact individuals. But for the most part, that’s the process. There are signoffs along the way, so that ETS can track items from bus to customer. There are a number of issues with that process. Two of the most obvious issues are the disconnect between the paper trail and the database at Churchill Square and the time delay between an item being found and that item being searchable. If you called on the same day you lost your item, staff would tell you to call back the next day because they’d have no way of knowing if something was found until it was in the Access database. Foundtastic solves both of these problems, and more. The process is largely the same, except that dispatchers no longer need to catalogue items on paper. Instead they enter them into the system directly. A paper manifest is still kept at each garage, but it is printed now, reducing the likelihood of mistakes or illegible handwriting. And by enabling each location to add the items into the database directly, the delay for customers is also removed. Now staff can tell you the same day if its likely that your item was found or not. Auditing is greatly improved now too. The system records whenever a change is made, whereas in the past something could be scribbled and crossed out on paper, making it difficult to track. I asked whether the idea of using scanners or photographs as part of the process was considered. Maybe using barcodes at the garage and Churchill Square to further automate the process of ensuring that everything that was found made it to the station. Both sides looked at the idea, but ultimately decided that the costs outweighed the benefits. Chad told me that like most software projects, the scope evolved and changed over time. Instead of “here’s the problem, give us a solution” it evolved into more of an agile development process. When it became clear that the paperwork could be reduced by allowing dispatchers to enter items directly, a slight business process change was required. That’s where Loren came in – he played a key role in the process, acting as the key connector between the City and Hybrid Forge. Chad remarked that Hybrid Forge “would not have been successful if Loren had not gotten involved” in the project. Loren was equally as positive about working with Hybrid Forge, saying he would love to work with them again. One of the most interesting things I learned is that Foundtastic is software-as-a-service, which means Hybrid Forge is responsible for hosting the application. At the open house, it was specifically stated that the solution would have to run in-house, so I’m quite pleased to see that the City relaxed that requirement (they indicated they would as the deadline for submissions approached). Foundtastic is an important system, but it’s not mission critical, so it was a great opportunity for the City to experiment with SaaS. An interesting challenge that Hybrid Forge ran into was the interface. As you can see, they’ve created an attractive user interface, but it was actually scaled back somewhat from their original designs. The application needs to be efficient for staff to use, so maintaining the Access-like data entry interface was important. While tabbing from column to column and making extensive use of the keyboard is the way Access works, that’s not typical on the web. Hybrid Forge used jQuery to maintain that experience for users. For those of you interested in the technical side of things, Foundtastic is built using ASP.NET MVC 2. 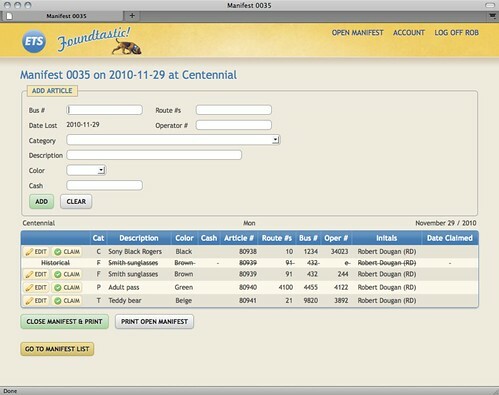 With Foundtastic, the City of Edmonton received a cost-effective piece of software, with a user interface that isn’t typical of City applications, and the opportunity to explore SaaS. For Hybrid Forge, the opportunity to showcase what they can do and the ability to count the City of Edmonton as a customer were both positive outcomes. And for you, the transit user, improved customer service is the big win. The idea that the LTEL project would be a way for local companies to springboard into a larger market seems somewhat less successful, however. While the City has arranged contracts and such to ensure that Foundtastic could be used in other departments, there are no immediate plans for that to happen. And Hybrid Forge would of course need to spend the time and money to identify opportunities and market their solution if they wanted to sell it to customers beyond the City, something they’re not likely to do as a company focused on custom solutions rather than product development. It seems that aspect of the project is something that TEC Edmonton could have helped with, but they were not involved beyond the initial selection process. I asked all four gentlemen if they’d do the LTEL process again, and if they’d recommend it to other software companies or other departments at the City. All said yes. That to me suggests that the pilot was a success! Of course, there are lots of improvements that will be made, and Bruce said the City is now operationalizing the process, and that an LTEL2 seems likely. I hope it happens. In the next six to eight weeks, another key aspect of Foundtastic will go live. Instead of having to call ETS to check if your lost item was found, you’ll be able to fill out a form on the website. You’ll be asked for some identifying criteria, and the system will tell you whether or not it’s likely that your item was found (it’s important to avoid specifics, to reduce the potential for abuse) and what the next steps are to retrieve it. 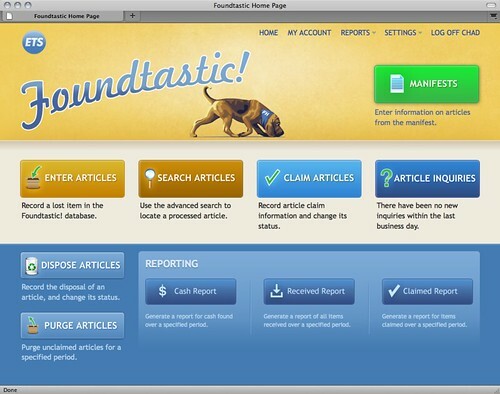 It’s another improvement to the customer service experience made possible by Foundtastic. Kudos to Geoff, Chad, and the team at Hybrid Forge for showing the City of Edmonton what local software development companies are capable of. And kudos to the City for experimenting with something new. It’ll be interesting to see how LTEL evolves!